this Creamy Beet Salad. 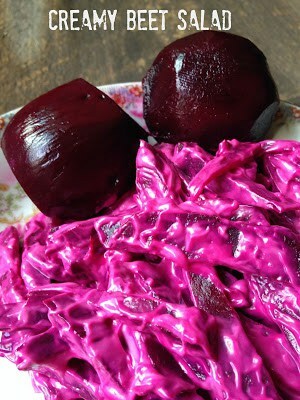 While researching recipes for an upcoming post, I “stumbled upon” a fantastic blog called: Natasha’s Kitchen Natasha’s Kitchen is packed full of delicious Ukrainian recipes, tips on family life and is full of beautiful photos. Commonly known as the garden beet, this firm, round root vegetable has leafy green tops, which are also edible and highly nutritious. The most color for beets, called beetroots in the British Isles, is a garnet red. However, they can range in color from deep red to white, the most intriguing being the Chioggia, also called candy cane, with its concentric rings of red and white. 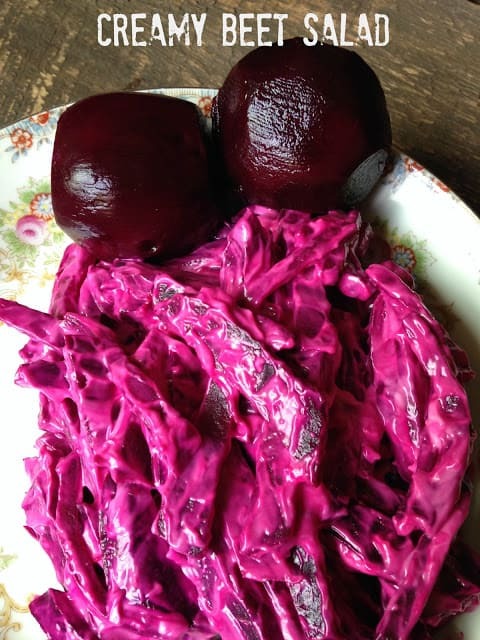 Beets are available year-round and should be chosen by their firmness ans smooth skins. If the beet greens are attached, they should be crisp and bright. Because the leach moisture from the bulb, greens should be removed as soon as you get them home. Leave about 1-inch of the stem attached to prevent lass of nutrients and color during cooking. Wash beets, remove greens. 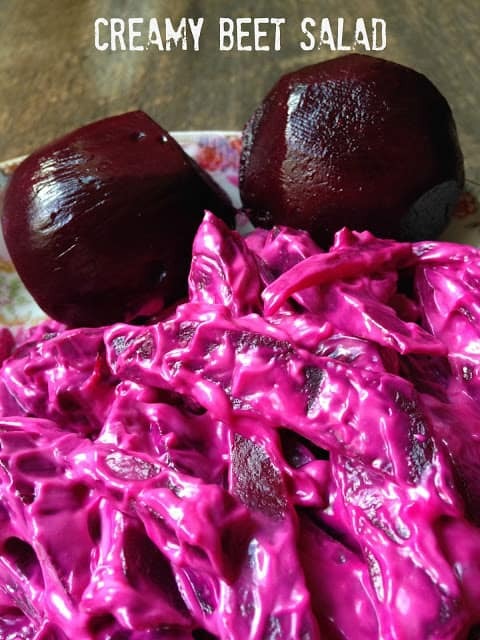 Boil beets with skin on for about 1 hour or until easily pierced with a fork. Drain, rinse under running cold water. When beets are cool enough to handle, peel off skin. Using a mandolin or knife, julienne beets into thin matchsticks. 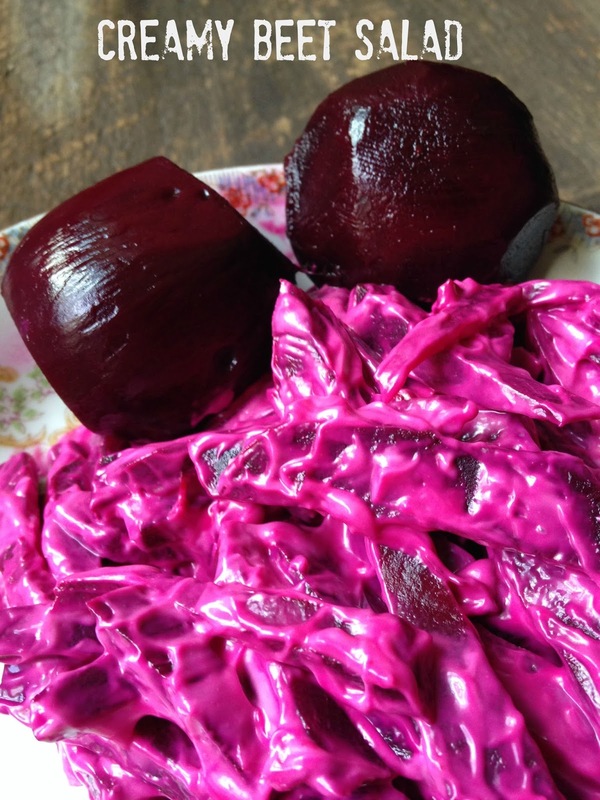 Place beets in a large bowl, top with onion. In a small bowl, stir together salt, pepper, sugar and mayonnaise until creamy. Pour over beets and onion. Stir, refrigerate salad for about an hour to blend flavors.